Yes, 21. Batten down the hatches for many brand-new components in meals right here on Noshery. But back into the dessert. I cannot also say adequate nutrients about this. I actually lightly based the meal when it comes to dessert on this fabulous meal on Crumbs and Cookies (seriously, go visit). Anytime we take it out of this oven, my brother Tay constantly states, "i could just smell the surface." What does that even imply?? The milk chocolate frosting is a great match towards the rich, dark cake. Whenever my the afore-mentioned Tay took a spoon out of the dish, he only began strutting around the cooking area like he previously simply singlehandedly conserved a busload of kiddies from crashing into a gap of vipers and I also had been like, "Um, exactly what are you performing?" in which he just said, "I like the thing I'm consuming!" And undoubtedly, the German chocolate frosting rocks ! as usual. We based this on the frosting for my German Chocolate Brownies, which I (really patriotically) designed for the Fourth-of-July. But once we all understand, (or while you would determine if you browse the brownie post), German chocolate dessert is perhaps not German at all. It's just made with "German chocolate" which is named after an American guy who is title had been German. 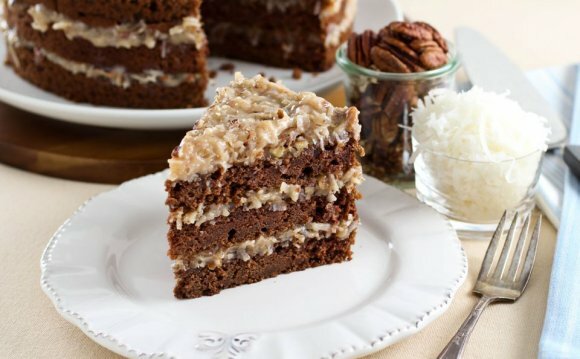 And this cake isn't also created using German chocolate, so I'm not sure what it really is. Whatever it's, it really is tasty. Good day. Preheat range to 350ºF. Put a greased circle of parchment on bottom of 3 8-inch pans (or oil them and dust them with cocoa powder). Combine the butter and cocoa and prepare on stove or perhaps in the microwave until melted. Gradually include the coffee and milk, whisking to combine. Include the sugars, eggs, and vanilla and whisk until smooth. Combine the flour, baking soda, cooking powder, and sodium. Add to the remainder and mix only until combined. Divide evenly between 3 prepared pans. Bake for 45 moments or until toothpick happens mainly clean. Cool before the removal of from pans (you might want to loosen from edges with a-sharp knife). Cool entirely before frosting. Combine the sugar, milk, yolks, and butter. Cook regarding kitchen stove, whisking constantly until bubbling and thickened. Include the vanilla, coconut, and pecans. Cool before frosting dessert. Melt the chocolate (i actually do it in microwave oven). If you're making use of chocolate potato chips in place of baking chocolate, always turn your microwave power way-down and stir frequently. Beat together the melted chocolate and butter. Add the cocoa dust and vanilla. Alternatively include the powdered sugar and milk until desired persistence is reached.